Hey guys, You will not find a box truck in better working order than this one right here. Although it may be used, the maintenance and work done on this thing are unparalleled. 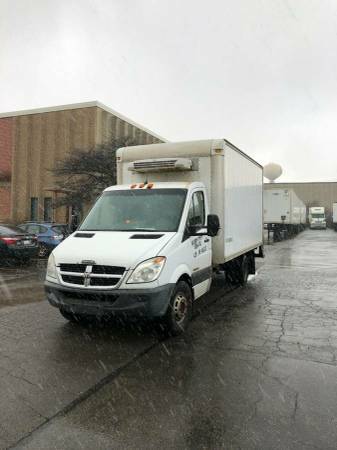 I’m selling this 2007 Dodge Sprinter 3500 V6 Turbo Diesel 12ft Box Truck in PERFECT running order with a refer unit and a loading ramp. Literally just installed a brand new alternator this week ($700), got a fresh new battery ($200). (Nothing was wrong with the old battery, I just bought a new one--you get both!) AND I did about ($6300) worth of tune ups this past summer INVOICE IN PICTURES. I drove this thing from Chicago to Los Angeles then to San Fransisco and back to Chicago without a single problem. As I mentioned, PERFECT. ALSO, yes, it does have a loading ramp attached to the back and a spare tire underneath. AND I’ve had the diesel particular filter bypassed ($600) which provides excellent airflow to the engine and helps immensely with the overall life of the engine as well. This is actually a huge upgrade and is one of the key selling points of this vehicle. The refer unit in the back is in perfect condition. The back gets ice cold, just like it should. This bad boy has about 213k miles, and runs like new. No lien, CLEAN TITLE. PERFECT BOX TRUCK FOR ANY USE. TEXT ME ANYTIME: Call anytime as well. Leave a voice mail if I don’t answer so that I know what your call was regarding.